Where I've been is places and what I've seen is things, and there’ve been times I’ve run off from seeing them, off to other places and things. I keep moving, me and this guitar with the silver strings to it, slung behind my shoulder. Sometimes I’ve got food with me and an extra shirt maybe, but most times just the guitar, and trust to God for what I need else. I don’t claim much. John’s my name, and about that I’ll only say I hope I’ve got some of the goodness of good men who’ve been named it. I’m no more than just a natural man; well, maybe taller than some. Sure enough, I fought in the war across the sea, but so does near about every man in war times. Now I go here and go there, and up and down, from place to place and from thing to thing, here in among the mountains. Up these heights and down these hollows you’d best go expecting anything. Maybe everything. What’s long time ago left off happening outside still goes on here, and the tales the mountain folks tell sound truer here than outside. About what I tell, if you believe it you might could get some good thing out of it. If you don’t believe it, well, I don’t have a gun out to you to make you stop and hark at it. With these words, Manly Wade Wellman introduced John the Balladeer, also known as Silver John, and the strangeness of Carolina mountain hollows and Pennsylvania folk magic. 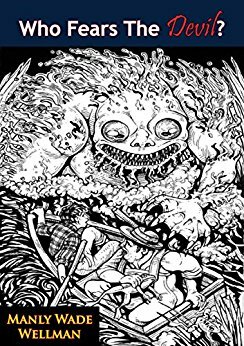 With naught but his silver six-string, John walks the Appalachians in search of a good tune, encountering witch men and folk monsters along the way. Whether driving off a son of the Salem witches, challenging a Biblical giant, or escaping the snares of the house-like gardinel plant, John rises to the occasion with his command of folklore, music, and good old horse sense. After all, with a little homespun faith, a good song, and a jingle of silver in your pocket, Who Fears The Devil? Please join the Puppy of the Month Club in July as we read Manly Wade Wellman's Who Fears the Devil?, exploring the works of one of America's celebrated fantasists. Labels: Appendix N, John the Balladeer, Manly Wade Wellman, Who Fears the Devil? This one I've read (I wrote a long post on it at the Castalia House blog). I may need to re-read it. Great choice, Nate. I read this six months ago based on HP's post at the CH blog, and it was so good I'm looking forward to a re-read and dissection. Amen, it's a great series of short stories.